Recently, I was fortunate enough to work on a fabulous project with some of the guys from EWN in the amazing Northern Territory. I really admired the teams passion and commitment and I thought how great it would be to have a chat with each of them over the coming weeks and share their responses here on our blog. I hope you enjoy getting to know the boys working hard behind the scenes a little better! Lets start at the top with Michael who has been with us since the very beginning and has given so much of his time and knowledge selflessly! He has an incredibly strong work ethic and he is super passionate about all things weather related. Michael is the driving force behind the EWN Alert Operators! In fact, you could say he's a ‘Desk Bound Chaser’ a lot of the time. He chooses to spend his time saving lives and property by monitoring weather conditions and managing the team administering warnings around the clock, Australia wide! Yesterday I grilled… I mean ‘interviewed’ Michael and here's what he had to say! Tell us a little bit about where you worked before you became such an integral part of the EWN team? After graduating from a business computing diploma in Lismore I was snapped up by AMP in Sydney to join their team as a business analyst. I worked on a number of life insurance and superannuation products, including their transition from mainframe-only to PC front end systems. The role evolved to include programming and production support and the quality control of changes into the live systems. In 1999 my wife obtained a teaching job in Lismore which was our ticket back to a country lifestyle. I left my job and soon found something completely different: media monitoring, a home based position summarising content from radio and tv news and current affairs programmes. By 2007 automation technology was encroaching and the media role was soon to end. The same week I read an article in the local Northern Star newspaper talking about a new system that sends SMS alerts to people in the path of storms. I was intrigued how this worked so I contacted Kerry Plowright and found myself in a new job role. Have you always been interested in weather? What is it you love about the weather? My interest began in primary school influenced greatly by the detailed weather forecasts on ABC TV news and tropical cyclone activity. High school geography classes reinforced the interest but it was a family move from Melbourne to Ballina in 1981 where I was able to experience thunderstorm and flood weather with regularity. I became obsessed with weather patterns that caused the floods in NE NSW and around the same time was taking up photography due to my father’s interest (and access to a film SLR), however I was only interested in unusual subjects such as timelapse images, floods and sky photos. My first attempt at lightning photography in 1988 was successful so I was hooked from that first time and still am 26 years later, and have to pursue all local storms where possible. In Australia I love the whole of NE NSW which includes the Northern Rivers, Northern Tablelands and NW Slopes and Plains, and also the QLD Darling Downs. Work over the years has prevented longer storm chasing journeys. I’ve also had three trips to Tornado Alley in the United States Mid West and all of the areas in the open plains and away from the major cities and towns are amazing for storm chasing. Dream storm chasing camera kit? What camera and lens are you keen on purchasing one day in the future and why? I use Nikon gear to this day as that’s what my first film SLR was and I’ve been able to re-use lenses over the years. I’m happy with the gear I have for photos but video remains a problem. Ever since high definition devices became mainstream the consumer priced sensors have typically been CMOS – which ALL suffer from ‘rolling shutter’ effect – which often ruins lightning footage. I’m yet to see a sensibly priced CCD sensor video camera so the dream is to see ‘rolling shutter’ eliminated from every video device. We would love to hear a storm chasing story if you feel like sharing? 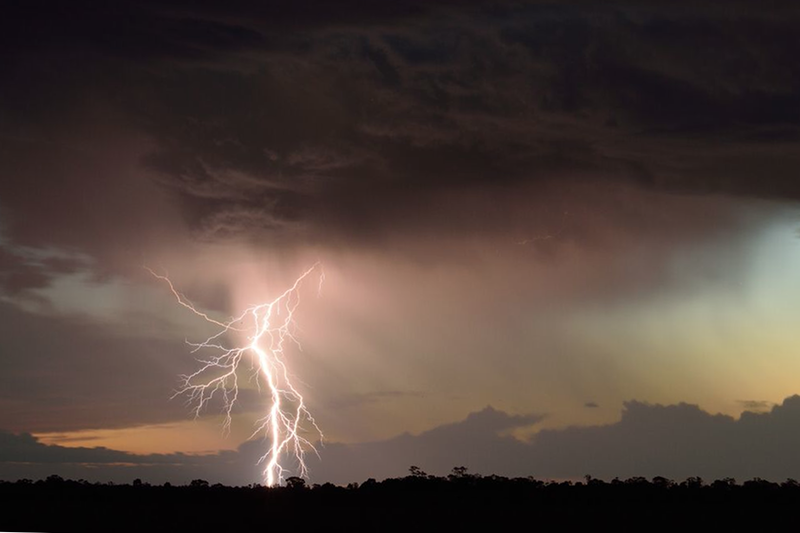 Given it was a Saturday and the charts had a slight risk of thunderstorms in the region, Jason Paterson and I headed an hour or so south to the Clarence Valley for some weather action. Storms can sometimes trigger on the mountains and drop off into chase country, even when conditions are fairly marginal. The afternoon was quite warm and humid and a few mushy storm cells managed to get going but soon dissipated. It was a matter of watching and waiting. Late afternoon I caught a glimpse of what appeared to be a solid thunderstorm anvil way off to the southwest – the contrast was terrible so it was hard to be sure at first. Sure enough we had a strong cell. The cloud tops were impressively high – that will improve our lightning chances! The storm was heading northeast directly towards us. We’d set the camera gear up next to a cow paddock on the outskirts of Grafton. As the sun dropped below some other clouds the contrast dramatically improved and it was obvious very early that the cloud structure had the appearance of a supercell. But what struck us very quickly was the amount of visible lightning – wow, we are going to get a show if this storm survives the 1200 metre drop off the ranges. It just got better and better – lovely branched lightning bolts, sunset light, awesome storm structure and we didn’t have to move. It was dark by the time the storm was close, and by then powerful branching CGs were hitting very close. It’s always the best when the lightning is close, but the danger factor goes through the roof. The photography wins until the last second. Just as we expect the wild weather to hit, we jump in the car and head northeast. Constant flashes of lightning are all around us. While Jason drives I’m still taking photos out the windscreen. The darkness allows for time exposures even when driving. 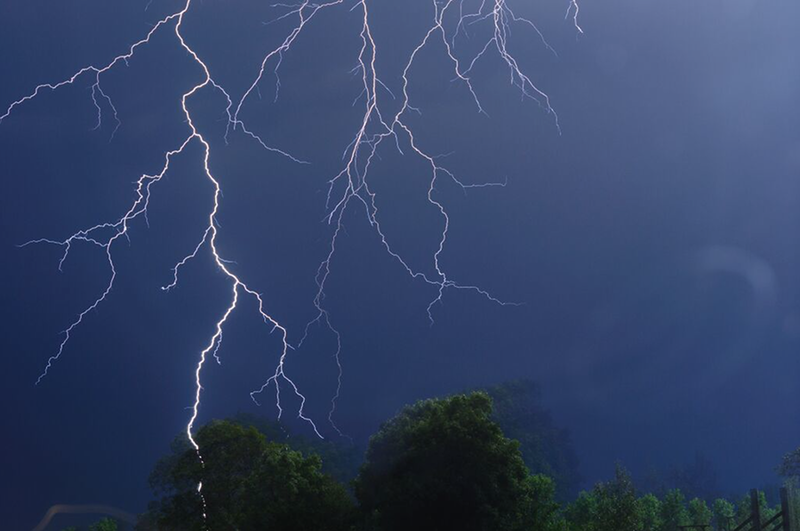 A fully branched staccato bolt smashes down within 50 metres of us – captured it !! Awesome. It is extremely frustrating having to drive when epic lightning is there for the taking, but you have to get into position. We arrive at Lawrence and set up with the Clarence River in foreground. Bang, crack, bolts all around. The danger level is at a maximum and you don’t know where to point the camera. Finally the storm catches us again and we have to move, but roads become unfavourable for another good position. Who cares, we got some epic bolts. Thanks so much Michael for taking the time to answer my questions! Your storm chasing story makes me want to be part of the action and the images you captured are amazing! Thanks everyone for reading. Feel free to post questions for Michael below in the comments or share your own storm chasing stories for us to read (links to stories are very welcome).